We have been putting up with this heat wave for about a week now! With mid 90's and high humidity, Autumn cannot arrive too soon for me! In spite of the weather, we tried to get out for a little bit on Saturday. We went to Pomptom Lakes, NJ where they were having their annual town-wide yard sale. Not too much success. I did pick up some cheap frames (of course none of them are the sizes that I currently need)! I also found an interesting antique mirror. We must have gone to about 50 sales. Most of them were junky, but you never know when you will find something good. By the time we worked our way to the older section where most of the antiques were, the weather had done us in! The heat was so oppressive that every movement was an effort! Oh well! Hopefully next weekend will be better. 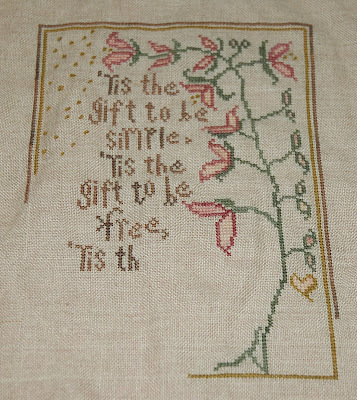 I did make more progress on 'Tis the Gift. One of the things I changed was the pollen. (I think that is what the little gold specks are). Instead of individual cross stitches, I am making them French knots. It is slower because of that, but I think it gives it a dimensional effect. Hopefully I will finish it up in a few days. This is so pretty and I agree that the fks will give it more dimension. I know lots of people do not like them but I always think they look so attractive. This looks like it'll be really nice when it is finished. Good idea for the pollen.